In Jingle All the Way, Arnie does battle against other holiday shoppers to find a toy that his son wants for Christmas. Of course the toy is sold out everywhere. The whole movie is about his attempt to get this toy called a Turbo Man. Also trying to get the same toy is Sinbad, who plays a postal worker who, uh, goes postal. This movie has great ratings on Amazon and most people think it is very funny. 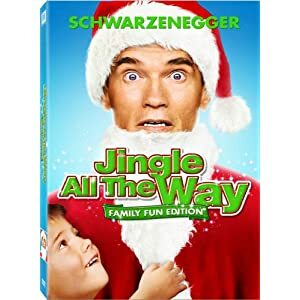 For guys who like Arnold and also like Christmas, this is a perfect gift. Curl up with some hot chocolate and popcorn and have a few laughs together.